The new formulation, enriched with Jojoba oil, protects the hair structure during the discoloration, making it suitable for fine and delicate hair. Volatility zero for the maximum respect for the environment and health. Thanks to the exclusive Vitality's patent, JO DECO is particularly delicate allowing it to be used even on sensitive subjects. Features: suitable for fine and delicate hair, contains rice starch which has a softening effect on hair and skin. Lets get lightening up to 6 shades and requires a shutter speed of up to 60 minutes. package : jar of 500 gr. 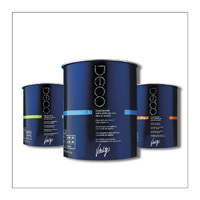 DECO Soft Whitener compact without ammonia - Bleaching powder compact extremely delicate. Ammonia-free and enriched with natural sources such as guar gum and starch of rice, lightens gently without damaging the hair structure. Donate soft lightening and is particularly suitable for natural hair, bases, medium-light, medium-fine hair. Features: suitable for lightening the tone -on-tone and delicate lighting effects, containing rice starch with softening effect on hair and skin. Lets get lightening up to 5/ 6 tones with a shutter speed of up to 45 minutes. package : jar 400 gr. DECO RAPID Whitener non-volatile fast-acting - Suitable for discoloration in whole head. Extreme performance with maximum respect for the hair. The creamy mixture lightening fast and high-grip makes this product particularly suitable for harsh bleaching of colored hair, medium-dark bases and medium-thick hair. It offers a good balance between shutter speed and lightening obtained : 6/ 7 tones in maximum 45 minutes. Thanks also to the starch of rice, skin and hair do not see affected their structure.